Many Bolingbrook residents are annoyed by noisy, radical geese encampments in the village. A receptionist for Claar said he was taking an urgent phone call and could not be disturbed. They have five days left to reach their goal of $13,000, and they’re over halfway there. If they reach their goal, the conference will be held August 24 through August 26 in Minneapolis. I’ve already donated, and I encourage others to join me. Multiple anonymous sources claim to have seen Russian operatives near many Will County voting locations. When the men offered Penning the ballots, she replied that it was against the law for her to accept them, and even if she did, the type of paper used couldn’t be read by the county’s optical readers. Penning said they were friends of Bolingbrook, then offered the men membership in the Bolingbrook Friends Facebook group. The men said they would consider her offer, then left. The source claimed that Penning then turned towards the judge, smiled and pointed at her “What Would Roger Do?” bracelet. On election day, DuPage County’s scanners couldn’t be shut down. Initial reports suggested a problem with the paper stock used for the ballots. When this reporter visited a polling site in Naperville, an official, who wished to remain anonymous, insisted the problem had nothing to do with the Russians. Bolingbrook’s wereskunks promised not to disrupt the public forum on garbage collection to be held on March, 26 at 6 PM at the Bolingbrook Community Center. Porter said that their members hope to address many misunderstandings that residents have about skunks. To me, he was one of few people who made an impact in both science and popular culture. I, and many others will miss him. After rapper MC Set Nine finished his performance in front of a small crowd of pre-teens, he pulled up a chair and asked the audience to move closer. An assistant handed him several large photos. MC Set Nine chose to hold up a picture of a painting of King George III. Nine holds up a picture of a painting. “This is God. What are God’s titles? “I want to be like Lucifer because I believe in freedom!” said an audience member. MC Set Nine is one the members of Humans Helping Others Out, Bolingbrook’s newest youth service organization. The staff members say that their support for Lucifer motivates them to serve Bolingbrook’s “at-risk youth,” but is open to families of all religious backgrounds. Both Heart Haven Outreach, and the DuPage Township Board members, refused to be interviewed for this story. Claar: I have not been questioned by Mueller! Panels should broadly fit The Orbit’s themes of atheism, activism, and culture and our identity as a social justice network. That doesn’t mean they have to be super serious, solemn discussions. We’re anticipating a music “panel” that includes performance, and we’ll be shocked if we don’t have panels on Steven Universe and Black Panther. They’re currently looking for panel and speech proposals. There’s more information on their main page. We’re currently thinking of our panel proposals. What panels do you think we should propose? Alien religions? The cryptids of Bolingbrook? Will future Bolingbrook residents worship Mayor Roger Claar? Is it safe to punch space Nazis? Bolingbrook: The most important village in the galaxy? No matter what panel we propose, this is promises to be a fun and thoughtful event hosted by our sister network. Will the 2042 Winter Olympics be held in Bolingbrook? Sources inside village hall say the village will bid for the games. 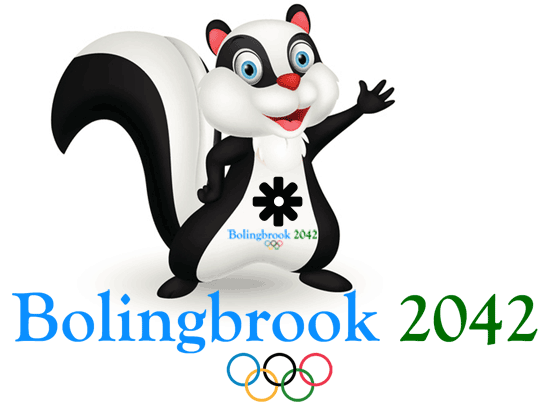 An alleged graphic of Snowy The Winter Olympic Skunk, the alleged mascot for Bolingbrook’s Olympic bid. According to the sources, the bid would commit the village to the most significant infrastructure project since the village’s founding. It includes a promise to add 100,000 seats to Rocket Ice Arena. It also promises to add a dome to the Bolingbrook High School Stadium so it could also be used to host events, like speed skating. The Leroy Brown Olympic Village would be built on the site now occupied by Bolingbrook Commons. Bolingbrook, according to the bid, would work with the village of Lisle to raise the height of Four Lakes’ ski hill by “several thousand feet” to make it suitable for downhill events. Sources say that the plan is for the village to use the revenue from the sale of its remaining lots at Americana Estates to pay for its Olympic plans. The sources said if the sales didn’t generate enough money, the village charter would be amended so the village would be required to issue the necessary bonds in 2032. Anonymous economic advisors for the Bolingbrook United party condemned the proposed bid. According to them, the debt from preparing for an Olympics can take decades to pay off. They noted that it took Montreal thirty years to pay off its debt from hosting the 1976 Summer Olympics. A receptionist for Claar said he was in a meeting with a trustee and could not be disturbed. Four Democratic candidates for the Illinois Sixth Congressional District seat participated in a lively debate at Bolingbrook’s Clow UFO Base. Bolingbrook Trustee Robert Jaskiewicz moderated the contest. It was viewed by approximately 100 Sixth District eligible voters who are currently residing on other planets. “Technically, Clow is not in the Sixth District,” said Jaskiewicz. “But we serve many residents in that district, and I am honored to help the Democrats make the best choice for a run against Representative Peter Roskam.” Jaskiewicz added that these candidates were the only ones who had clearance to enter Clow UFO Base. Sean Casten, Carole Cheney, Amanda Howland, and Kelly Mazeski each argued why they were uniquely qualified to address the covert issues facing Congress. The four candidates discussed many issues, like: The war between the Illuminati and the New World Order; the Martian Colonies recent threats against humanity; asteroid mining regulations; and banning Alcubierre drives. They all passionately argued against cutting federal funding to UFO Bases. Bolingbrook Mayor Roger Claar looked at his Roskam cuff links and ignored Cheney. After two hours, each candidate made a closing argument for the candidacy.